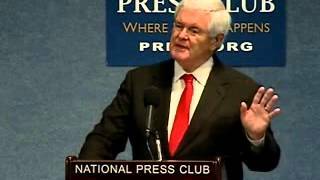 The six points that I want to make I think many have made it, and Speaker Gingrich probably was most eloquent in his last intervention. 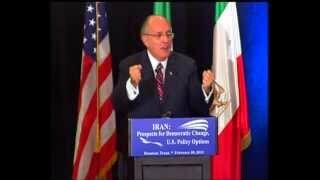 First, the regime in Iran. It is intensifying suppression. Why? Because the economy's in bad shape, there's high unemployment, 40 million in Iran are under the poverty level. The only way the regime is able to stay in power is by intensifying that repression. Secondly, the destructive role of the regime in the region. Every bad movement in the region, every terrorist, is supported by Iran. In Syria, a leadership there that is killing its own people, that is starving its own people. The strength that it gets from the regime in Iran is one of the last bastions of support that it has before it falls—and it will fall. [applause] And the spread of extremism and fundamentalism, in Hamas and Hezbollah and Al Qaeda, and the security threats that are posed to all well-meaning and human rights loving people in the Middle East threatens the very positive, very positive movements that have been caused by the Arab Spring. Number three, the nuclear issue. How many times have we heard that Iran is ready to negotiate on the nuclear issue, that it's ready to halt its uranium enrichment, that it's ready to enter into negotiations with European countries and the United States? We hear this constantly, constantly. But then nothing ever happened. There's always an excuse. It's either the International Atomic Energy Agency or another international group that sees the reality of what Iran is doing and that is its relentless drive to acquire nuclear weapons. And the Western world cannot allow that to happen. Number five, I think this regime change is feasible. The people of Iran want a change. I arrived from the United States this morning on one of those flights where you don't know what time zone you're in. And I went to the Left Bank and had lunch with my assistant. And this is a true story, but a woman and her husband approached me. They were here on a dermatology convention in Iran. A dermatology convention here in Paris. And this woman said to me that she had seen me on television on North Korea, and she wanted to know why I hadn't done anything on Iran. And I said, "Well, I am going to try to do something." But this was a woman that said change is needed in my country. And we need America and we need the Western world. This was spontaneous. And this is why I think this movement is very, very strong. Now, my last point, the recognition of the resistance. I believe that this is a serious movement because it has support. It has you. It has passion. And that's shown by your attendance, by your listening to the 14 hours of all the speakers. And I'm going to contribute to a short speech, which I'm about to conclude. But most importantly it's a cause. 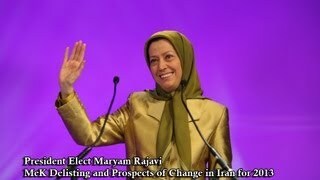 It's a cause that I believe is defined by Madame Rajavi's ten points. And you heard what those ten points were. Not going to tell you what they are because you know. But it's human rights, it's democracy, separation of church and state, but a deep abiding faith in human beings. It is peace loving and a foreign policy that respects the point of view of others. It is a movement that most importantly respects women. And if you look at the Middle East, if you look at the Arab Spring, if you look at Africa, if you look at Afghanistan, the countries that have the most trouble, the ones that are considered the most repressive that eventually fall, are those that violate the rights of women. And what we see here in this movement is a solid identification and solid support for the importance of the respect for women. So after two years, after my coming here to this same hall and seeing the growth of the movement, seeing the MEK delisted, seeing how louder you have become in your passion, because I think you think and know that the end is near and that victory will be achieved. [applause] Thank you very much.